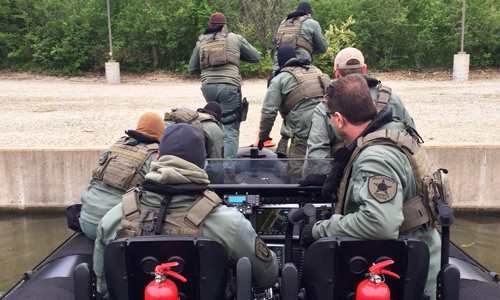 As seen above, the Will County Sheriff’s Special Operations Group practices high-speed vessel-interdiction and boarding-team delivery operations on the Des Plaines River just south of Chicago, Illinois. The Will County Sheriff’s Department recently took delivery of a 9.5 Meter Tactical Operations Boat for the exclusive use by their Special Operations Group. Since the actual boat delivery took place during the harsh Chicago area winter months, at the request of the SOG Commander, OCM divided the training for into two separate parts consisting of several days of classroom instruction which took place in January and then several days of underway training just completed this May. Their Tactical Operations Boat was delivered with many advanced features including a fully three-axis shock-mitigating console and shock-mitigating team-seats both designed by Shock wave Seats®, a wireless crew communication system and a thermal camera to name just a few. 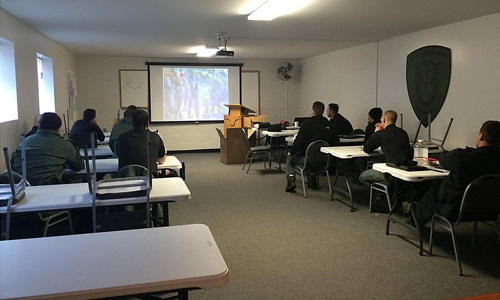 The Will County Special Operations Group proved to be one of the best groups of students we’ve seen in a long time, remarked OCM’s Todd Salus, they were very quick studies of their new boat’s capabilities.